The Del Rio League is one of our area’s most competitive, year after year. This year, the stories were whether fast-rising La Serna could bump off recent league boss California, and who would grab the third spot in both competitions. On the boys side, California reversed two earlier losses, and put four in the first six to edge an injury limited La Serna 27-32. Whittier confirmed their move up from the first meet by again finishing third and taking the final CIF spot. La Serna’s Andrew Hernandez moved up from 3rd & 4th in the first two league meets to take the individual championship in 15:23 in a very close race. Andrew had 8 second gap back to the second finisher, Angel Salinas (California), and the next five all finished within the next nine seconds. The two top teams took all of the All-League spots. For California, it was Ethan Ruiz – 4th/15:36, Andres Espinoza – 5th/15:38 and Jack Martinez – 6th/15:39, with all three moving up a bunch from the first meet. Lancers Jesse Montez – 3rd/15:33 and Gerald Baltzer – 7th joined champ Hernandez in the honors. Whittier was led by frosh Miguel Viderique – 12th/16:07. El Rancho narrowed the gap to Whittier but were fourth again – their best was George Castillo -10th/16:04. Matthew Mora – 9th/15:55 led fifth-placed Santa Fe. The girls competition grew tighter with each league race, leading to an exciting final where the top three were separated by only nine points. California were the winners. La Serna closed their gap to the Condors from 14 points in the first meet to 7 here, but were again second. Santa Fe almost surpassed the Lancers, but fell one point short. There was an interesting grouping of the top three teams. Santa Fe put three in the first five, but their #4 & #5 were only 19th and 20th, which pushed them to third. California had two in the first six, but clinched the win with a 10-11-12-13 finish by their next four runners. La Serna had two step ups in the first seven, but one runner finishing below her usual place left them in second. Santa Fe’s Katie Bautista finished an undefeated league season with a 18:21 win and was joined in the All-League group by teammates Kayla Viramontes – 4th/19:06 and Dulce Fortiz – 5th/19:17 – big step ups from the first meet where they were 9th and 13th, respectively. Remy Vigil/La Serna closing in on Kayla Viramontes/Santa Fe with 200m to go. Cal’s Zoe Gurule narrowed the gap to Bautista from earlier meets, but was still 9 seconds short to finish 2nd/18:29. Stephanie Reynoso was 6th/19:20 to earn All-League honors. 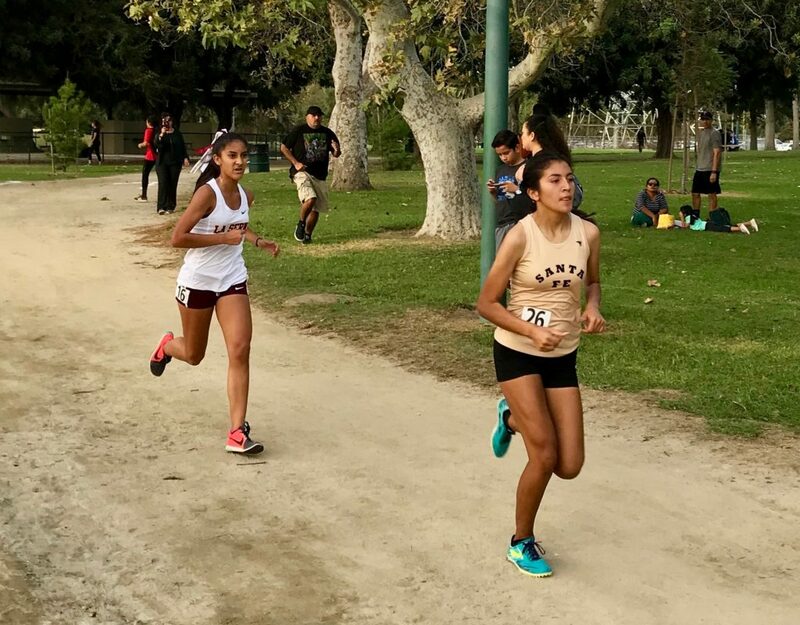 Remy Vigil – 3rd/19:01 and Natalia Interiano – 7th/19:21 earned the remaining All-League spots for La Serna. Xitlali Pulido led fourth-placed Whittier at 8th/19:22, heartbreakingly missing All-League honors by 1 second and advancing to CIF by 2. Jessica Hernandez – 17th/20:20 was best for fifth-placed El Rancho. Santa Fe’s Kayla Viramontes, 4th place Girls Varsity is a freshman and was named Del Rio League Rookie of the Year.